Anand Rao - PETAL et al. 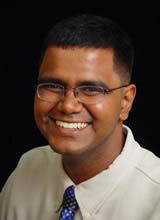 Anand earned his Masters in Computer Engineering from Illinois Institute of technology in Chicago. Anand has been professionally involved in Software Development for the past 10 years mostly woking on Java related technologies. He currently is an Associate Developer working for Chase Bank. His passions are travelling and cooking.